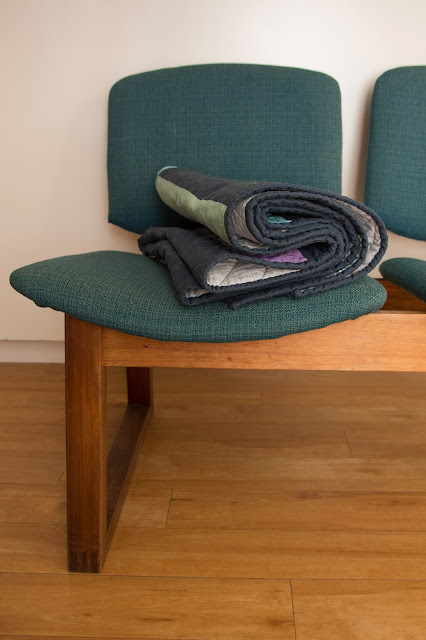 If my kids play with quilts or blankets the game always ends up as "sausage rolls" where they roll each other up in the quilt then roll all around the house. There's no way a white background quilt was going to last at our house. Well I didn't ignore you dear blog readers. 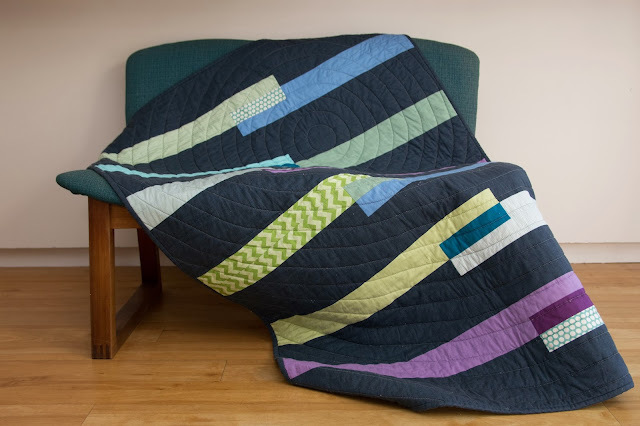 I clicked on every link and looked at every suggestion and of course I ended up deep in the linky pages of quilting blogs, seeing things that an ambitious novice should never see without having to sign up for a pay per view tutorial. And the problem that I had was this: I'd created the back of the quilt just in an ad hoc, that looks good there kind of style, and there's no way I could line the front and back up such that horizontal, straight line quilting wasn't going to chop through the Start Boat block in a really ugly way. The front is all horizontal lines, the back was all vertical lines and the two needed to find some kind of compromise. Circles it was! But here's where I screwed up. I very carefully pinned the front and back with two layers of lovely cotton wadding together. I took lots of care to make sure the panels were aligned such that both were straight with respect to each other. I used lots and lots of those bendy safety pins that the real quilters use. I drew on my first circle using a wine glass (empty already and that could have been part of the problem) and then used my walking foot (real quilter tools, see) with it's width guide arm thingy to make expanding concentric circles 1.5" apart. The quilt moved a bit but I smoothed and repined and made sure I was starting each circle in the middle somewhere. I completely failed to notice that the front was sliding around and so the backing was no longer square to the front. The only thing that saved me from tears was that I completely failed to notice it happening. I proudly showed the finished quilt front to Flipper, declaring it to be the best Travel Quilt ever. Then flipped it over with a flourish to show him the back of the Best Travel Quilt Ever only to see the leaning strip of wonkiness and cry out "Oh C*^K!" There was nothing for it but to laugh and make a further declaration that apart from taking one photo for posterity it will never be held up vertically like this again. I soothed myself with some handsewing using a twisted chainstitch for the title and backstitching for the rest of the lettering. The book gave great instructions for the binding and how to get the corners nice and square. It was a bit different to how I'd ever done it before but very well explained. 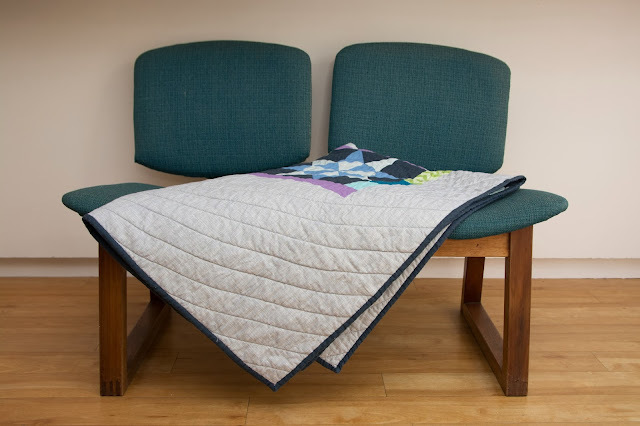 By the time I'd wrapped it over my legs and sewn the binding on I was sufficiently snuggled and happy with my quilt to forgive myself that crappy fabric shifting mistake. I think P will like having his own quilt, and I'm happy that I've finally made him one that's not too babyish that he can't keep it for a few years to come. I'll wrap this along with a stencilled Darth Vader T-Shirt for Christmas! And that's ticked off project number 12 of the 20 (or 21) in my Cover to Cover Challenge. Are you sewing along? I completely love it, wonky edges and all! I got to visit the big quilt exhibit that toured the US a couple years ago - nearly every one of their quilts was wonky or wobbly in some places, too. 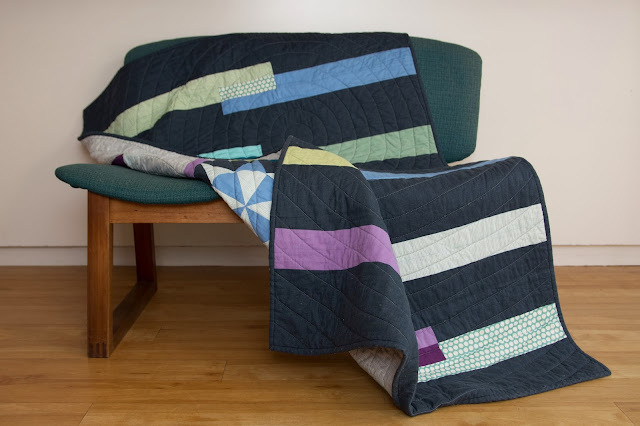 I think it's just the nature of a unique, handmade quilt! This is gorgeous! I had to re-read to determine exactly what was wrong, because I totally didn't notice by looking at the picture. I love the concentric circle quilting you did. What an amazing job! wow, this quilt is amazing! i had to look several times to even see the wonkiness. i think it works for this quilt. i love it and the concentric circle idea was brilliant! well done, and surely to be well loved, too! 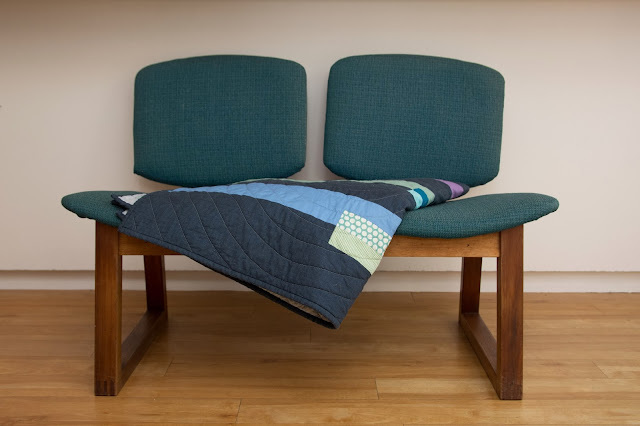 Brilliant quilt! 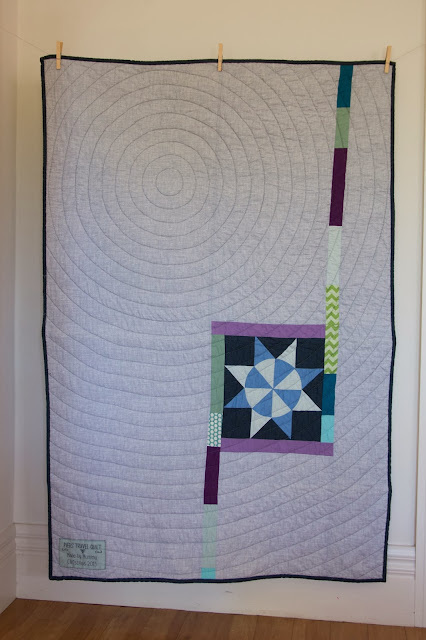 I love the juxtaposition of circles with the straight lines and the asymmetric placement of those quilted circles. It could easily be argued that the "wonkiness" was always intended..... You are too harsh on yourself! It looks great! I like your version. It's awesome!! Wonky schmonky - it looks fantastic. I love that you quilted it in concentric circles, definitely plays nicely with the horizontal/vertical stuff you have going on with the patchwork. Oh my - this is AMAZING!! I'm in awe of your skills - wonkiness and all! 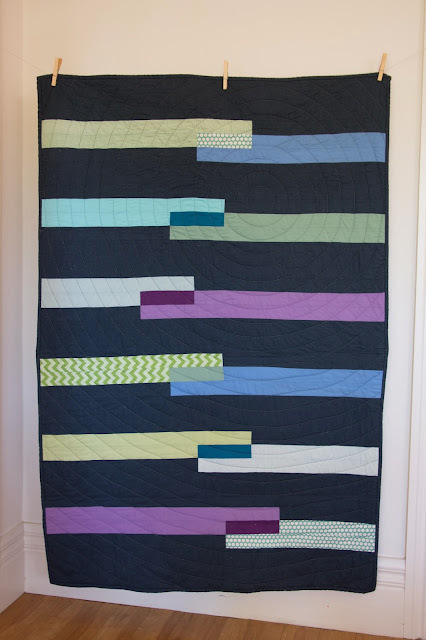 This quilt is a treasured physical reminder of your love, and I'm so very impressed by your ability to create it. 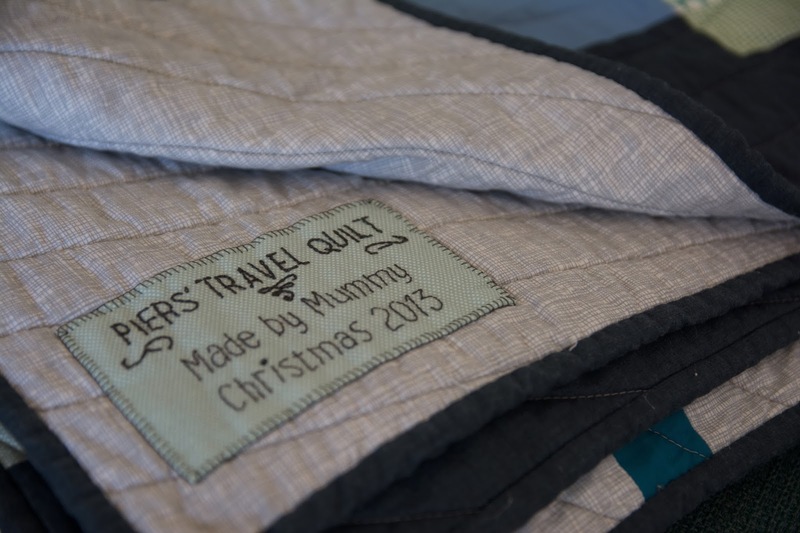 Besides the awesomeness of the quilt itself, I simply love that hand stitched tag on the back! 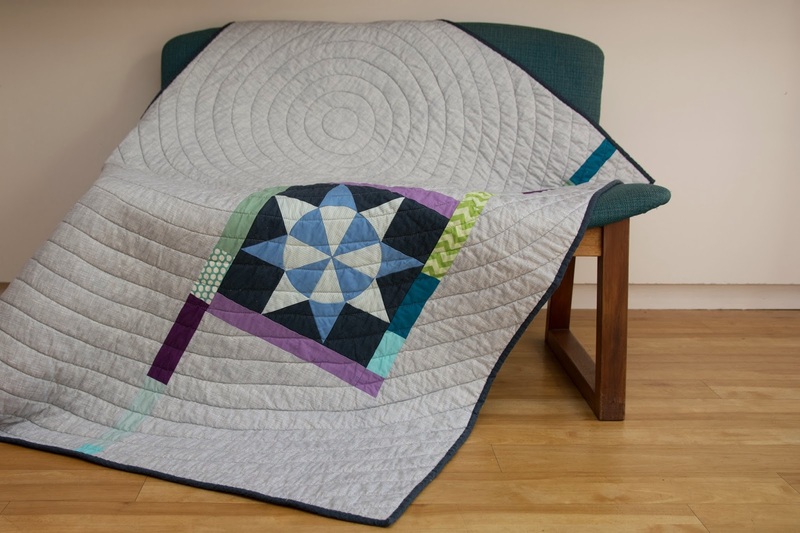 Wow- I love the colors and the circular quilting! The substitution for white on the front is fantastic and so practical. And the wonkiness- I really had to reread and look carefully at your picture to figure out what you were talking about! Also this challenge is giving me some good motivation to sew up a few more of the projects in this book for Christmas- thank you! I looked and can see no wonkiness. Just a really nice quilt. It looks absolutely stunning, well done! Your boy is very, very lucky. Thanks everyone. I'm glad no-one felt miffed that I seemingly ignored all advice that I'd received about how to quilt it. I think I have about one quilt every eight years in me, otherwise I'd need a long-arm sewing machine, a bigger table and all those other gadgets to make life easier. It's really heartwarming to read all your lovely comments. My new years resolution is to get better at timely responses!